The Professional Regulation Commission released the Registered Electrical Engineers and Registered Master Electricians in just two working days after the last take of examination in all designated testing center nationwide. PRC announced that there are 884 out of 1,886 Registered Electrical Engineers and 1,134 out of 2,705 Registered Master Electricians on April 2015. The Board of Electrical Engineering and PRC in Manila, Baguio, Cagayan de Oro, Cebu, Davao, Iloilo, Legaspi & Lucena conducted the Electrical Engineer Licensure Examinations on April 26, 27 & 28, 2015. BoEE members are Engr. Jaime V. Mendoza and Engr. Francis V. Mapile. PRC usually made available online the official results of the said exam in three (3) working days after the last day of examinations. So you may expect the releasing of the exam results on the second week of May 2015. Maybe on Monday, May 4, 2015. There are 2,190 out of 3,661 Registered Electrical Engineers and 972 out of 2,964 Registered Master Electricians successfully passed the Electrical Engineer Licensure Examinations last year of September. The commission promise to announced later the date and venue for the oathtaking ceremony of the new successful examinees in the said examinations. 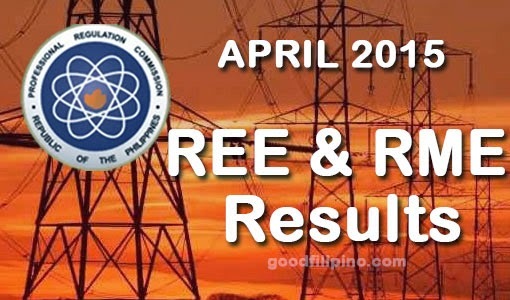 Comments or suggestions about "PRC Electrical Engineer Board Exam Results: REE & RME List of Passers (April 2015)" is important to us, you may share it by using the comment box below.